Apple has developed a new technique that would hide a biometric reader inside an iPhone or a Mac and let owners lock down their systems with fingerprints or even facial recognition —all without ever having to break from their usual routine. 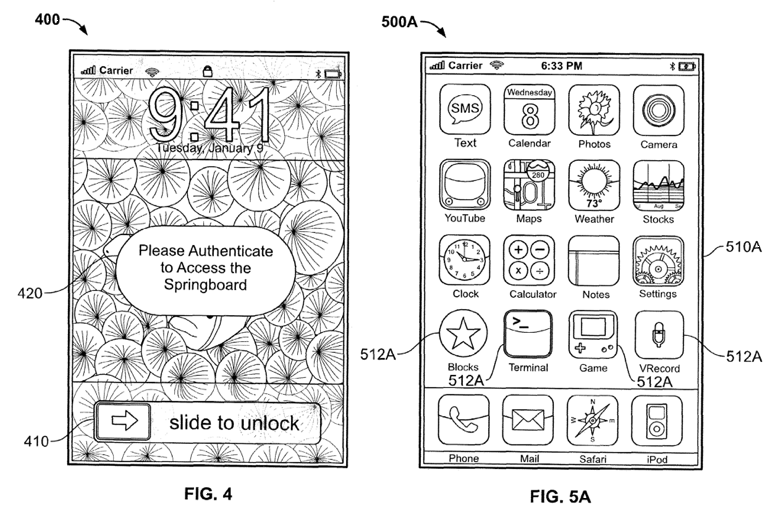 Published for the first time this week, a patent filing for the process reveals that Apple wants to provide a more secure method for preventing unauthorized access to a whole device —or private information on that device —than current techniques like passcodes; however, it also wants to avoid taking up the owner's time with a separate scan or consuming extra space with a distinct reader. The solution, the company suggests, would be to automatically use a sensor either hidden within the device or else repurposed from its usual role. Devices could recognize a fingerprint or finger vein pattern simply by waiting for the user to touch the display, which would hide the sensors on or behind the screen. A forward-facing camera could alternately look for retinal patterns or even recognize the facial features of owners when they're in the right position for use. Notebooks could use the trackpad, palmrest and a webcam for a similar purpose. Apple goes so far as to suggest the possibility of recognizing the user's distinctive voice or even collecting DNA samples to recognize a user's genetic sequence. Biometrics could also be context-sensitive and detect the shape of a user's ear before allowing a call to go through, for example. 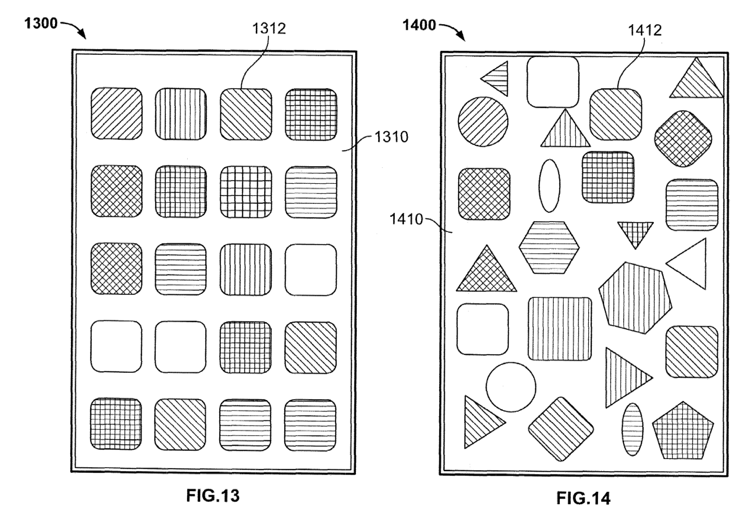 As an alternative to biometrics, Apple further proposes using other, non-alphanumeric but also less obvious locks: in hardware, owners could get access by providing their voice to a microphone or tilting a device in certain directions. On touch devices, users could place their fingers in a particular pattern on screen, make gestures or tap out a sequence. A more direct alternative to passcodes could also exist by making users match up shapes and colors through on-screen icons. How likely it is any of the new inventions will appear isn't known. Even so, it's clear the processes were developed with the iPhone as a reference. 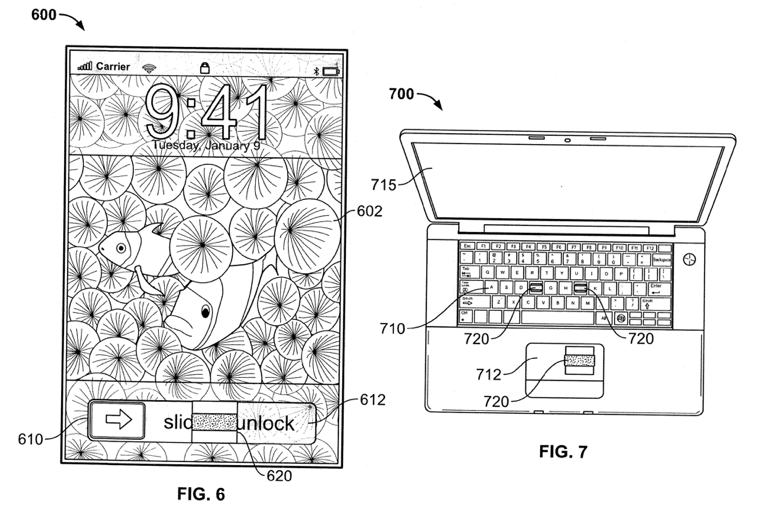 Drawings included with the patent mostly show mockups of the handset's interface as it was when the patent was submitted in September of last year. Also, heading up the list of inventors is "iPod father" Tony Fadell, who helped develop the original iPhone and left the company just two months after the application first reached the US Patent and Trademark Office, to be replaced by former IBM executive Mark Papermaster.